First, we'd like to share a recipe of hers that may look familiar: Sweet Potatoes Anna with Prunes -- it's the best Thanksgiving side we know. Ephron took on the nom de plume mrsp on FOOD52, and seemed to get a kick out of her anonymous, lasting contribution to the community. She also shared her recipe for the World's Greatest Chili, and was intensely annoyed that it wasn't named a finalist or even a community pick in the chili contest. It's tough love here at FOOD52. On how she learned to cook: I cooked every single recipe in Michael Field's book and at least half the recipes in the first Julia, and as I cooked, I had imaginary conversations with them both. Julia was nicer and more forgiving -- she was by then on television and famous for dropping food, picking it up, and throwing it right back into the pan. Before long, American men and women were cooking along with Julia Child, subscribing to the Shallot-of-the-Month Club, and learning to mince garlic instead of pushing it through a press. Cheeses, herbs, and spices that had formerly been available only in Bloomingdale's delicacy department cropped up around New York, then around the country. On egg-white omelettes: You don't make an omelette by taking out the yolks. You make one by putting additional yolks in. A really great omelette has two whole eggs and one extra yolk, and by the way, the same goes for scrambled eggs. Every so often I would look at my women friends who were happily married and didn't cook, and I would always find myself wondering how they did it. Would anyone love me if I couldn't cook? I always thought cooking was part of the package: Step right up, it's Rachel Samstat, she's bright, she's funny, and she can cook! The pepper shaker contained ground black pepper, which was outlawed in the 1960’s and replaced by the Permanent Floating Pepper Mill and the Permanent Floating Pepper Mill refrain: “Would you like some fresh ground black pepper on your salad?” I’ve noticed that almost no one wants some fresh ground black pepper on his salad. I resent that asking for salt makes me seem aggressive toward the chef, when in fact it’s the other way around. This was right around the time that arugula was discovered, which was followed by endive, which was followed by radicchio, which was followed by frisee, which was followed by the three M's -- mesclun, mache, and microgreens -- and that, in a nutshell, is the history of the past forty years from the point of view of lettuce. But I'm getting ahead of the story. My mother didn't serve Yorkshire pudding, although there is a recipe for it on page 61 of "The Gourmet Cookbook." My mother served potato pancakes instead. I serve Yorkshire pudding and potato pancakes. Why not? You only live once. The first--and best ever to this day--cheesecake recipe I made was in Heartburn. I have searched high and low for a copy of it. The one I used to cook that cheesecake was a library copy I borrowed on several occasions. Oh, how I wish I had a copy of that book I'd make that cheesecake in her honor! "Make a nice graham cracker crust and pack it into a 9" pie pan. Then mix 12 oz cream cheese with 4 well-beaten eggs, 1 c sugar and a tsp of vanilla. Pour into the pie shell and bake 45 minutes at 350. Remove and cool 15 minutes. Then spread gently with 2 c sour cream mixed with 1/2 c sugar and bake 10 minutes more. Cool and refrigerate several hours before serving." Oh my gosh! Thank you! I'm thrilled to have this recipe. Where'd your mom get a copy of the book? If you make the cheesecake, let me know if it's as you remember! every article. every quote. just another level of greatness and relatability. thanks for this. a wonderful start to the morning. A very nice tribute . . . . I absolutely adore Nora Ephron. I also loved her very opinionated Piglet entry as the final judge the first year of the competition. Wouldn't it be nice if she could direct all your consumer choices? Will definitely be attempting her sweet potato dish this fall, and the chili, too! There aren't nearly enough smart funny Jewish women who can cook in this fershluggeneh world, and we've just lost the President of the Sisterhood. This means that Ruth Reichl simply must live until she's 95, at the very least. Thanks for this fine tribute. 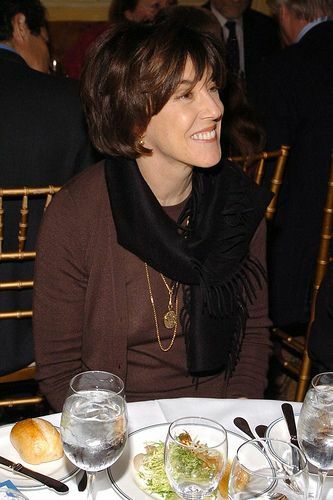 Every time I read Ms. Ephron or heard her speak, she brought a smile my face. In her immortal words that I will always remember her by: "I'll have what she's having." I remember the Shallot-of-the-Month Club! Much discussion over whether the pronunciation was SHALlot or shalLOT... Thanks for letting us in on this secret corner of her life. She was always one of my favorite writers; books, movies, essays and anything she scribbled. I felt like she was my Jewish sister even though I never met her. I just noticed that I was one of the two cooks who followed her on food52. I hate it when I read something that makes me cry and I'm at the office--now I have to go repair my mascara. Thanks for this--it's really great. Sob. Such a remarkable person. There are really no words. But, this is a wonderful tribute. I am so, so sad about Nora's death. What a smart, honest, authentic, hilarious woman who really lived her life! An inspiration! Wow. had no idea that she had a Food52 id.. Make her passing all the more personal.. R.I.P Nora..thanks for the memories! I just spent the last hour delving into all the links in the article. I cannot believe there will be no more Nora. The world will be a poorer place. I loved Nora Ephron, for the liberty and laughter she brought In Julie and Julia. I love her commentary on lettuce. Thanks for a great tribute to a wonder.